What Is a Non-Compete Clause in a Media Contract? Whether you've landed your first media job or you're moving up in your media career, you will undoubtedly run across a non-compete clause in your contract. 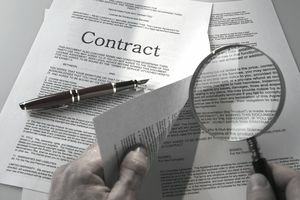 Before you sign, know what a non-compete clause in a media contract as well as its limitations. Non-compete clauses are a standard part of most media job contracts. They are designed to protect a media company by restricting where the person signing the contract may work in the future. In other words, a non-compete clause means you can't have a bad day at your station and decide you're going to quit to go work across the street at the competing station. No matter how you further your media career, you will likely be confronted with an employment contract at some point. That used to only be true for on-air broadcasters or well-known print columnists, but now contracts also cover many managers and behind-the-scenes professionals. While media companies' standard contracts may differ widely in length and detail, the vast majority include non-compete clauses. This language will prevent you from leaving your current media company and jumping over to a competitor, usually within a specific time frame. For example, in local television, you may be a TV news anchor in Dayton, Ohio. A non-compete clause in your contract would keep you from joining the news team at any of the other stations in town. You might be forbidden to go to another station for six months to a year after your contract expires. Some differences in contract language might allow you to go to another station in Dayton immediately after your contract's expiration, provided you're not on the air for a certain length of time. That change in wording is sometimes negotiable before the contract is signed. Because Dayton is close to Cincinnati, it is possible that a non-compete clause might not only include other Dayton stations but also those in Cincinnati. That's because there is likely overlap in the broadcast signals between the two television markets. That point may also be negotiable, because of the limits it puts on you in furthering your career. Non-compete clauses are put in place to protect media companies, not you. A TV station does not want to spend a fortune advertising you as its top anchor through billboards, print advertisements, and other media just to see you on a rival station six months later. That's understandable. Still, these clauses are being tested in the legislatures and courts of some states. Whether they're enforceable if you're terminated from your station and want a job at another station in town often comes into question, depending on the state and other circumstances.